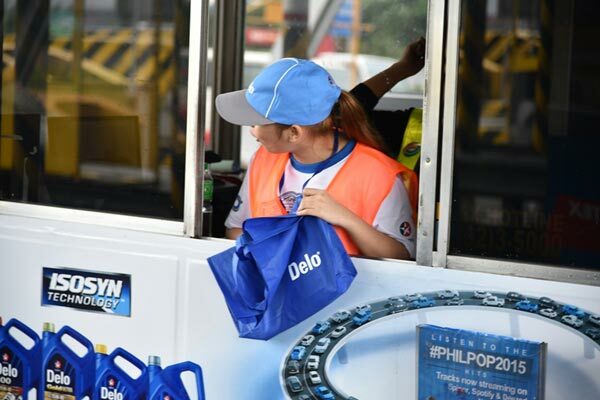 Manila, Philippines, — Delo® , a global brand distributed by Chevron under the Caltex™ master brand in Asia Pacific, has some treats for Filipino motorists as it celebrates 80 years of bringing people further. Through its Let’s Go Further Today campaign, Delo® aims to inspire and enable people to go further with their lives, pursue their passion, and make their days extraordinary. Delo® will hold several exciting activities aimed at motorists who want to go further. “This is our way of showing our appreciation to all Delo® users and motorists alike. We’ve been in the market for 80 years and have helped various lifestyles go further. Moving on to our 81st year, we are grateful that more people and industries trust us with their engines and businesses,” shared Chevron Area Business Manager for Philippines and Vietnam Joe Bronfman. To jumpstart the campaign, Delo® will treat motorists who pass through North Luzon Expressway (NLEX) with free toll fee. This happened at the Bocaue Toll Complex on October 2 starting at 7:30am and lasted for an hour. Aside from free toll, motorists will also get Delo® premium freebies. Delo® will also offer discounted lubricants and limited edition Delo® merchandise in select Caltex™ Stations nationwide for the months of October and November. This promo is open to the public— Delo® and non- Delo® users alike. “We are returning the favor to Delo® users who continue to trust us all these years with these offerings, and at the same time, we are also inviting non- Delo® users to give our product a try to experience its full benefits,” explained Bronfman. Aside from these, Delo® will also provide free parking in various locations across the country, as well as free full meals from Jollibee as gift to loyal Delo® users who continuously trust the brand. Delo® recognizes the vital role of PUV drivers in propelling our society and economy forward. To return the favor, Delo® will award two drivers who exhibit outstanding behavior and commitment to exemplary service for the commuting public. Chevron’s Delo® product family includes diesel engine oils, greases, gear lubricants, engine coolants, and transmission fluids formulated with ISOSYN® Technology. Delo® products are found in all major industries including commercial transportation, construction, mining, agriculture, and power generation. These performance benefits can be seen through the experiences of our customers in a variety of markets. Delo products are available in all Caltex™ stores, auto supply stores, and do-it-for-me stores nationwide. For updates on Delo® activities, like the Caltex™ Lubricants Philippines Facebook page.